This week, as we continue our Friday travelogue feature, we head to the west coast and make a pit stop in the ocean town of Half Moon Bay, California, which is located only 28 miles down the coast from San Francisco. 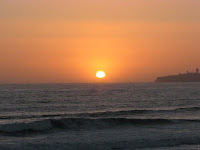 We camped there last month at the Half Moon Bay State Park which was right on the beach. 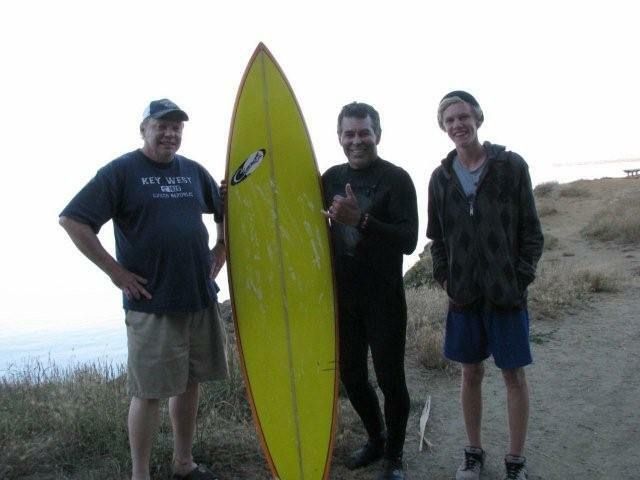 I developed a fascination about Half Moon Bay several years ago when I watched the movie Riding Giants which is a great documentary by Stacy Peralta about big wave riders. 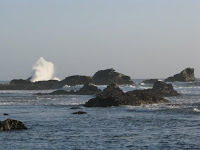 The first person to recognize Mavericks a a surfable spot was legendary surfer, Jeff Clark who grew up in Half Moon Bay. 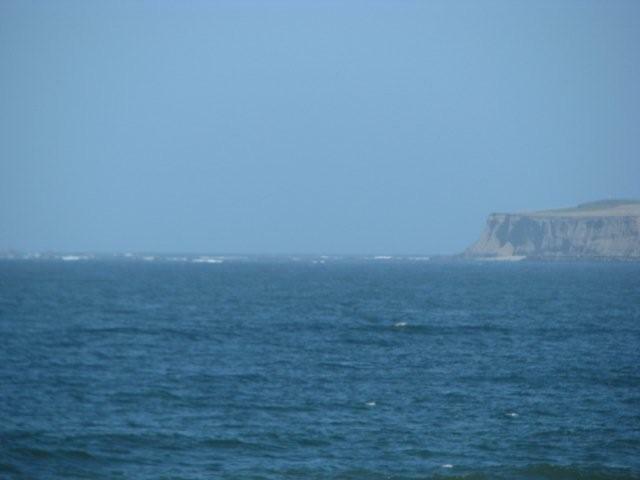 To that point the break and the rocks were only considered a navigational hazard. When Clark was in high school in the mid-70's, he could see the Mavericks break from his school and finally decided to give it a go. For 15 years, Clark surfed by himself and could not get anyone else interested in seeing what he had in his own back yard. Then all of a sudden, surf magazines converged on his town and it was the next big thing and now Clark hosts the annual Mavericks Surf Invitational each winter. Mavericks is not an easy place to get to. 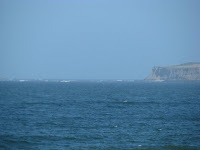 There is a half mile hike to a point and then another half mile swim to the main breaks. On the day we went to Half Moon Bay, we headed down the trail to the point and had not gone far before we ran into Jeff Clark himself. Clark was incredibly friendly and surprised that folks from Tennessee were big fans of his and had watched Riding Giants the night before. After we talked, he posed for pictures and headed on back to his car. The one thing I never understood from the movie was why he couldn't get anyone to come surf at Mavericks for 15 years. His only explanation was that in 1975 you could have had a lot there for free with a subscription the the San Francisco Chronicle. Even though it was close to the big city, no one would venture down there. Now a trailer on a pad goes for $500,000. So, if you are ever in the bay area, after you do the San Francisco thing, head south down the beautiful coast highway and check out Mavericks and Half Moon Bay. Jim Diamond has the story of Pred's Associate Coach Brent Peterson helping out at the Little Predator's Hockey School. Jas Faulkner looks at the Predator's ownership's commitment to strengthening the team and keep it local. Forechecker has his ten toughest back to back games from his super schedule. Without the Olympics, this season's schedule is less compact. Dirk was also up early this morning with his Breakfast Links. Michael Langlois reflects on our discussion on POTG Radio from Monday and how the Leafs could build learning from the Predator's model. 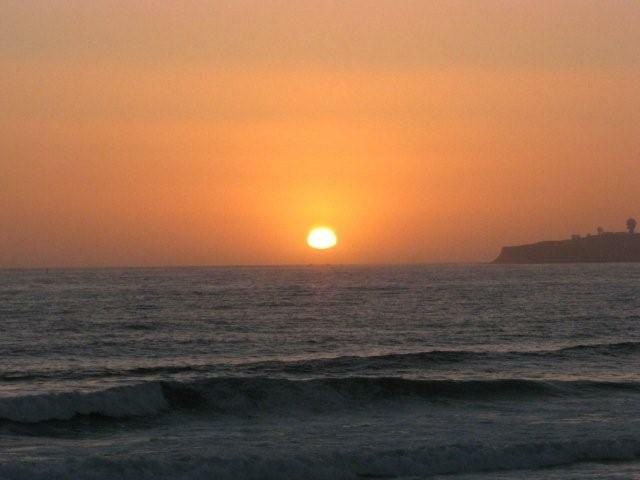 Mark Willoughby's "My View" is from the beach this week with some deep thoughts about life. Part three of four in the Predators gains and losses series is up at Predlines. PredsBlog is up to goal five on Hornqvist's season review. From @mkeadmirals: Admirals sign forward Mike Bartlett to an AHL deal. Bartlett had an assist in four games with the Ads during the playoffs last season. Arbitration award for the Bruins Blake Wheeler was $2.2 million. Antti Niemi's award is expected to be announced on Saturday. Sean Leahy discusses what Chicago might do as a result. The Thrashers avoided arbitration with Andrew Ladd. Matt Reitz looks at the thirty NHL coaches jobs and how coaches move from one to another. He likes the new trend where there is fresh meat on the scene. From the Point has a post by One Smart Pug that should help keep the rivalry going between Pittsburgh and Washington fans. Ryan at the RLD keeps his re-drafted series going with 1998. I can't believe the Preds did not take David Legwand again with the number two pick. After mentioning that the Kings had a strong defense yesterday, we hear that Matt Greene will miss a big chunk of the season with shoulder surgery. Blade of Funny lists all the topics that they don't want to write about. It's actually a pretty good summary of recent hockey happenings. Filming on the movie Transformers 3 is set to start at Kennedy Space Center on September 17 and Brevard County is abuzz with folks wanting to work on the movie. The Wall Street Trail in Bryce Canyon is open for the first time since an April rock slide closed it for about the hundredth time. It has only been open once in my five visits to the park. Satellites the size of a beanie baby box are doing the work full size ones used to do for a fraction of the cost. Why can't I get Google Sky Map for the BB? A Princess cruise ship hit their second whale this year in Alaska. It's kind of like deer hits that we have around here. Los Angeles Kings fans have been somewhat frustrated by the lack of key pick-ups this summer to push the team to the next level for a deeper playoff run in the coming season. Tuesday's pick up of Alex Ponikarovsky was no where in the same league as the King's stalking of Ilya Kovalchuk before he signed with the Devils. Our friends at Kingscast captured the trauma of the Kovi saga with Waiting for Kovalchuk part one and part two. One of the advantages of bowing out of the Kovalchuk race is the fact that the Kings will have funds to commit to Drew Doughty, Jack Johnson, Wayne Simmonds and others to lock up their core for years to come. With a tough young defense and an abundance of riches in goal with Quick and Bernier, the Kings are poised to return to the playoffs and should have a shot at making some noise past the first round if things come together as a team. We caught up with Drew Doughty at the NHL Awards and asked about his Olympic experience as well as his thoughts on the coming season. The short career of Denis Grebeshkov as a Predator came to its final resolution on Wednesday as reported by @dchesnokov: KHL's SKA has agreed to contract with defenseman Denis Grebeshkov. Pred fans can keep an eye on Edmonton second round pick Curtis Hamilton who was chosen with the draft pick that the Preds traded fo Grebeshkov to see the final outcome of the deal. Jeremy at Section 303 recounts the brief career of Grebeshkov with the Predators. PredsBlog takes a look at whether the Preds made the right decision not to re-sign Grebs. Finally, The Grinder has the final word quoting David Poile saying that he just didn't "fit our salary structure" (or any of the 29 other NHL team's either). Russian Hockey Fans has a translated story on Alexander Radulov who "never regretted his choice." I wonder if they figured out how to translate "douche" into Russian yet. Maybe a picture of Rads would suffice. PredsBlog has a post and video about Kevin Klein's potential as an outlet passer. Predlines has Part two of four in her series of the Pred's losses and gains. Forechecker reports on Gnash's summer job. Jim Diamond catches up with J P Dumont at the Little Preds Hockey school. Do you have a question for ex-Pred Jason Arnott? If so, go here to ask it. I already asked the one about him being "uncomfortable" as the Pred's captain. AJ celebrated his birthday yesterday and put up a really nice post thanking those around him. We probably don't do enough of that, so hats off to AJ for his birthday and thanks for being an all round good guy that I am proud to call friend. From @dchesnokov: "KHL President Medvedev told Pavel Lysenkov of Sovetsky Sport that SKA is ready to offer a 17 yr contract to Ilya Kovalchuk." Maybe everyone could save face if he got his 17 years in the home country. I would think Jay Grossman would have an action against the NHL for Tortuous Interference on a Contract if he lost his commission due to the league's action. The Hockey News has the top ten offseason moves and lists the NHL shooting down Kovi's contract as number one. The Phoenix Business Journal has a story recounting the City of Glendale's dealings with Ice Edge. It still sounds like the City is getting cold feet and pointing fingers. It looks like the Blackhawks and Antti Niemi are headed for an arbitration showdown this morning in Toronto as they have yet to come to an agreement for next season. With the Hawks already over the cap, whatever is awarded will be additional salt in the wound. On the Chicago front from @MurphysLaw74: "La Presse reporting Blackhawks backup plan in case Antti Niemi's arbitration award is too high is to trade Niemi and sign Jose Theodore." Mirtle updated his free agent list again showing 70 players still up for grabs. From @CraigCustance Spitfires officially signed Campbell today in Windsor "Jack is a big part of our future" This should make a strong team stronger. Campbell was very composed at the draft. The Stars got a good one. Ryan at the RLD redrafts 2003 which was one of the best draft years in recent history with 29 first rounders making the NHL. Matt Reitz discusses why the NHL arbitration process is so heavily avoided by both sides. This is the time of year when a Ben Eager signing in Atlanta or the Caps acquiring D J King actually gets headlines. The Ducks also signed Cam Fowler to an entry level contract. From @aaronadmirals: "Darren Haydar has signed with the Chicago Wolves." Haydar was once a Pred but has probably been the best AHL player of the last 15 years setting all kinds of career records. He never could make the jump to the NHL. There appears to be an online petition to promote Pam to take Michael's job as the boss on The Office. I don't think so. Tapeleg recommends this video with Merlin Mann to learn how to improve your blogs and podcasts. The Predators officially announced the two prospect games against the Florida Panther rookies that will be held at the Savology.com Iceplex in Sunrise, Florida on September 15 and 16. Nashville, Tenn. (July 28, 2010) – Nashville Predators President of Hockey Operations/General Manager David Poile announced today that a team of Nashville Predators prospects will travel to Sunrise, Fla., for a pair of games against Florida Panthers prospects on Sept. 15 (6 p.m. CT) and Sept. 16 (11 a.m. CT) at Saveology.com Iceplex. This marks the third straight season Predators prospects have played a Southeastern Division opponent during their camp, which starts Sept. 13 with testing. In 2008, they hosted the Atlanta Thrashers for two games at Bridgestone Arena, and in 2009 a team of rookies traveled to Duluth, Ga., for games at the Thrashers practice facility. Prospects expected to attend the camp include first rounders Jonathon Blum (2007), Chet Pickard (2008), Ryan Ellis (2009) and Austin Watson (2010) and second rounders Blake Geoffrion (2006), Roman Josi (2008) and Charles-Olivier Roussel (2009). The contests will precede the opening of 2010 Training Camp, which occurs the following day, Sept. 17, with testing and physicals. The Predators’ first day on the ice will be Saturday, Sept. 18 at the Centennial Sportsplex and they will play six preseason contests from Sept. 23-Oct. 3, including three at home (Sept. 23 vs. Carolina, Sept. 25 vs. Washington and Sept. 27 vs. Atlanta). Last night, I was privileged to be a guest host along with Anthony Curatolo on Ryan Porth's RLD Radio's show that featured Kevin Allen of USA Today and Canada's next "Schwartzcaster" Launy "The" Schwartz from Hockey54. Kevin Allen gave plenty of insight into the upcoming arbitration between the NHLPA and NHL in the Kovalchuk matter. Launy provided the latest update in his bid to become Canada's next sportscaster in the Drafted 2 contest. He also gave insight into which Canadian cities would be successful if another NHL team were to go to Canada in the next few years. With the offseason in full swing, it's great to have a variety of hockey shows on BlogTalkRadio to keep the hockey talk going strong every night. It was a great show that moved from serious hockey talk of the day on to fun and frivolity at the end with me doing my impression of Launy, with a Southern accent, and also trying to convince Ryan to go to the Nashville Roller Girls final match of the year to cover the action. Check it out. There's more summer hockey talk tonight on BTR with Chris Wassel and his gang celebrating two years of shows with a special birthday show to commemorate the occasion. Adam Proteau, Sean Leahy, Russ Cohen and others are scheduled to appear. It gets started at 8 p.m. EDT. In an article at NHL.com, Pekka Rinne is shown to be one of the NHL's best goalies in the shootout. Jim Diamond has a story about goalie prospect Anders Lindback being too big for his pads at this summer's development camp. Section 303 speculates on the signing of Patric Hornqvist. Bryan Mullen at the Tennessean says that the Hornqvist deal is David Poile's top priority. David Boclair also discuses the value of Hornqvist as does Dirk Hoag at On The Forecheck. PredsBlog has a few notes in Puck Pile. Predlines starts a four-part series of gains and losses from the Preds roster. Aaron Sims looks at what the Predator's opening day roster may end up looking like. Danielle Browne has more on Chuck Weber leaving the ECHL Champion Cincinnati Cyclones to become the head coach of the Rochester Americans. Darryl Dobbs doesn't see a whole lot of fantasy value for Preds players. That's fine if they continue to score and win by committee. Ken Campbell explains that the arbitrator in the Kovalchuk case could conceivably restructure the contract to make it a flat $6 million a year for 17 years. Coyote's Hip Shot rants at the latest Ice Edge news. Coyote fans are sick of the situation and makes us thankful that the local owners stepped in in Nashville and avoided the same type mess. The Yotes Examiner, Anthony Perez, questions the competence of the City of Glendale in handling closing the deal with Ice Edge Holdings. I did a little checking with a trusted source in the valley that confirms that the COG mat be the ones in question at this point, not the Ice Edge group. From @mirtle: Bill Daly on the Coyotes situation: "We don't have any comment on the report. We have no new information on Ice Edge's bid." TSN reports that Ice Edge denies that they are having trouble with their financial dealings. The press conference for the Winter Classic was held at Heinz Field yesterday and had all the drama of a neighborhood tiddlywinks contest. However, it was about as close as you get to live hockey in July. Here is NHL.com's take on the event. The best part of the event was after the NHL Network cameras were off and the players on hand took shots at the goal post with pucks. They should have had Max Talbot give his opinion about Alex Ovechkin if they had wanted something newsworthy. Here's an article with the "expletive" not deleted. I was unaware that it was that bad a word. I'll have to start washing the kids mouth out with soap when they use it. Matt Reitz has a few things to look forward to at this year's Winter Classic. While the media was at Heinz Field, Mario and Sid took a spin on the ice at the Consol Energy Centre. Michelle Kenneth looks at the possibility of a lockout in 2012. Matt Moulson and the Isles avoided arbitration with an agreement on a one-year, $2,45 million contract. Along with the Mason Raymond contract on Monday seems to be giving the Preds a good idea what Patric Hornqvist may be worth. Several other notable signings yesterday included, Alexander Frolov by the Rangers, Thomas Fleischman by the Caps, and Alex Ponikarovsky by the Kings. We had a good discussion on RLD Radio about whether a team would want Frolov or Poni for $3 million with no clear answer. Blake Wheeler's arbitration hearing was held but their has been no ruling yet. Regardless of the outcome, if the Bruins accept the result, it will put them over the salary cap. Ryan at the RLD does a "what if" and redrafts the 2002 Entry Draft based on what is known of the class today. Puck Daddy has a story about a woman who wants to burn the Stanley Cup for a cause. This is an interesting idea to support loved ones with cancer. Intent to Blow say's Jay Grossman has found time for a new client, a hockey forum commentator. What is it about an 80's night that brings out the worst in people? Here's a video from the Rogers Centre from Monday night's Jay's game. Adrian Nadeau updates that their begr8ful.com site has really taken off. In a negative world, it is good to see folks acknowledging their blessings. Last night on POTG Radio we had a great mid-summer doldrums show. Michael Langlois, who runs the web site Vintage Leaf Memories, was with us and we covered a wide range of topics. Michael has been a fan of the Leafs since the late fifties and shared his perspective on the changes in hockey over the last fifty years. Surprisingly, we also discussed Lane Kiffin and the bridges he has burned in his career. Michael is also a communications adviser and we discussed coaching for individuals in how to deal with the media. Another area that Michael is involved is training couches and youth workers on how to communicate with players and parents in youth sports and activities. If you have never checked out Vintage Leaf Memories you should spend some time at the site and read story after story about hockey from earlier times and how it relates to the headlines of today. Please give us a listen with the following player or download the podcast at iTunes. I will be a co-host tonight on Ryan Porth's Red Light District Radio. Guests are scheduled to be USA Today's Kevin Allen and Canada's next great sportscaster, Launy "The" Schwartz of Hockey 54. Big news for the Predators was yesterday's signing of Ryan Parent to a two-year deal. Mason Raymond avoided arbitration and resigned with Vancouver and it appears to be close to what Patrick Hornqvist may want. Forechecker compares the two players. Bryan Mullen has a note that the Predator rookies will travel to Florida on September 15 and 16 to play the Panther rookies in a couple of games. 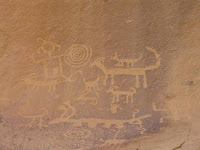 There are a few more details at the Panther's site. The Predators will kick off a new ROI Program for local business leaders at a breakfast at the Patron Platinum Club on August 4. You need to sign up by Friday if you are interested. From @Sullivan26: Proud to announce The Lever/Sullivan Charity Tournament raised $60,000 for KidSport Timmins. Thank you to all who attended the special day. Predlines wonders what happened to the real Jordin Tootoo. Amanda also questions what the Parent signing means for Jon Blum. Coach Chuck Weber is leaving the Cincinnati Cyclones for an AHL job in Rochester. Rachel at What The Puck speculates that Fulton Reed in the Mighty Ducks movies may have been the original Shea Weber. Winging it in Motown dives into Tennessee's "Jock Tax" and the burden it places on visiting players. As expected, the NHLPA did file a grievance toward the NHL for ruling that the Kovalchuk contract was an attempt to circumvent the salary cap. Bill Daly responded with an appropriate statement. Launy at Hockey54 fires up the web cam for a little Kovalchuk Kontract Kontroversy. Kingscast continuation of "Waiting for Kovalchuk" is now available. More great stuff. From @DarrenDreger: It will be interesting to see if the league calls the LA Kings to testify in the Kovalchuk case. Not sure, but I'm told it's a possibility. Perhaps, comparing term. Nothing is off limits in this hearing. More this morning from @DarrenDreger: Decision on Kovalchuk is expected to be made as early as next week. Process of choosing arbitrator started last night and will cont today. After a few rumors over the weekend of the Coyotes/Ice Edge deal falling through, Rebekah Sanders has more detail on the issues at hand. It appears that Ice Edges has not met stated deadlines in the deal. This is not good news for Phoenix fans who have been jerked around since last summer. News of today's big off-season media event from @NHLschuylerb: Event at Heinz Field for 2011 Bridgestone NHL Winter Classic. In Pitt preparing.... Expecting Mario, Sid, Talbot, Cooke, Dupuis, Knuble, Steckel among others. First look at new WC logo & retro Caps and Pens logo. Starts at Noon ET. Live on NHL Network, NHL.com, penguins web site, Caps web site, Sirius XM sat. radio & 1250 ESPN Radio in Pitt. Derek Zona looks at the mess created by Sheldon Souray's contract in Edmonton. Boston is well over the cap with having Blake Wheeler and Tyler Seguin signed. Matt Reitz looks at their situation. Wheeler's arbitration hearing is set for later today. The Tampa Bay Lightning have hired Tod Leiweke as their new CEO. He will also have ownership interest. Blueshirt Banter takes a look at the NHL deal with Versus and a potential return to ESPN. The Carolina Hurricanes released the logo for the 2011 All-Star game that will be held at the RBC next January 20. Mirtle updated his top 100 UFA list. There's still plenty of average players to choose from. A web site dedicated to the upcoming KHL-NHL exhibition games is now up. Adrian Dater writes what sounds like a eulogy to the past year covering a wide range of topics at All Things Avs. We don't talk about the Tennessee Titans much but the best news out of their camp in years is them suing Lane Kiffin and USC. Few people have burned bridges and stirred up venom better than Kiffin when he left the University of Tennessee so it was good to hear of a little more trouble going his way. Dilbert creator Scott Adams has some ideas on how to be an active listener. Have you ever heard of Olga, the traveling bra? There is a website as well as a travel blog for the piece of undergarment. This is really different. According to this survey, fans of the NHL and MLB feel more connected through social media. Who knew? The Nashville Predators signed the recently acquired Ryan Parent to a two-year deal that will pay him $850,000 in the coming season and an even $1 million the following year. If Parent stays healthy and shows improvement over his performance in Philadelphia last season, it will be a good deal for both sides. Nashville, Tenn. (July 26, 2010) – Nashville Predators President of Hockey Operations/General Manager David Poile announced today that the club has signed defenseman Ryan Parent to a two-year, $1.85 million contract. He will make $850,000 in 2010-11 and $1 million in 2011-12. Parent, 23 (3/17/87), was reacquired from Philadelphia on June 19, 2010 in exchange for impending unrestricted free agent Dan Hamhuis; he was originally Nashville’s first selection, 18th overall (first round), in the 2005 Entry Draft and was sent to the Flyers in the trade that saw the Predators obtain Peter Forsberg on Feb. 15, 2007. The 6-3, 198-pound blueliner played 48 regular-season games for the Flyers in 2009-10, posting three points (1g-2a) and 20 penalty minutes, as well as suiting up for 17 of the club’s 23 postseason contests in its run to the 2010 Stanley Cup Finals, posting a goal and two penalty minutes. Since making his NHL debut with Philadelphia following his final junior season with Guelph (OHL) in 2006-07, the stay-at-home defenseman has posted seven points (1g-6a) and 36 penalty minutes in 102 regular-season contests, and two points (1g-1a) and eight penalty minutes in 27 playoff games. A native of Sioux Lookout, Ont., Parent has won three gold medals and a silver medal with Canada in international competitions, claiming titles at the 2006 and 2007 World Junior Championships and 2004 U-18 World Championships while captaining the Canadians to a silver medal at the 2005 U-18 Worlds. Tonight on POTG Radio we are finally going to have the show that we have been looking forward to for some time. We will have communications pro, Michael Langlois, who runs the web site Vintage Leaf Memories among many other duties. Michael and I are the same age, but he has been a die-hard Leaf's fan since he was old enough to know what was going on in the late fifties. Many interesting stories are recounted at his site. He was a broadcaster in the seventies and eighties but moved on to start his own company in 1989 as a communications adviser to many sports entities and individuals as well. Tonight's show should be interesting as we will try to understand many of the issues in hockey today with a long look back at history to see how we got to where we are today. The "Weekes for Backup Campaign" got the attention of Craig Custance at The Sporting News who has a post about it on Saturday. Happy Birthday to Dirk at OnTheForcheck who turned five yesterday. Forechecker got the discussion started for the weekend asking if there was a moment in Preds history that caused fans to give up on the team. Jim Diamond caught up with one of the newest Predators, Matt Halischuk, at the recent development camp. He and Nick Spalling were on the same line together in juniors. NHL.com has an extensive look at the growth of hockey in Nashville and the Preds drafting a hometown player. Predsblog takes an look at what the Preds are getting from David Legwand. He is also up to goal number four for Patric Hornqvist and has serious questions about Ryan Parent's abilities. Chris Rydburg compares Alexander Radulov to a Cheating Ex-Girlfriend at Pro Sports Blogging. Rachel at What The Puck watched The Mighty Ducks last night in week one of her summer hockey movie watch. SeePuckCity has started a new site called GoalieAGoGo to follow his pursuit to become a goalie. There is a new book coming out about Jordin Tootoo written by Melanie Florence. Amazon lists the availability date as August 23. Preds UFA Hugh Jessiman was picked up by the Blackhawks where he will attempt to take the monkey off his back as the only 2003 first rounder not to play in the NHL. It appears that the NHLPA will file a grievance against the NHL today before the 5 p.m. deadline. The process of finding an arbitrator and setting a date will not be a quick one I am afraid. Dave Gutzman wonders if Kovalchuk could become the next Radulov. The National Post has more on the NHL's weak case on the Kovi contract. Matt Reitz gives Gary Bettman a break this week for challenging the Kovalchuk contract. Wife, Dahlia, tells all on The Schwartz. Interesting stuff that makes him the best candidate to be the next Canadian sportscaster. #DraftTheSchwartz. Launy also got the attention of the local newspaper in Thornhill who did a nice piece on him. Patrick Hoffman looks at the tough summer it has been for goalies looking for a job, especially Marty Turco and Jose Theodore. Popular Islanders broadcaster Billy Jaffee, who also is a regular on NHL Live, did not have his contract renewed with MSG. Chris Botta is at a loss as to why. Adrian Dater picks his top ten centers. Maple Leaf Gardens certainly has a new look with a grocery store under the third floor rink. Adam Proteau misses the Tweets of Paul Bissonnette as much as anyone it appears. Intent to Blow's weekly wrap has a very LA look to it with kudos to Kingscast and View From My Seats. ESPN Outside the Lines looks at the dangers of arena/stadium food. This got a lot of discussion over the weekend. The Islanders got a clean slate while the Caps appear to be one of the worst. The Huffington Post looks at America's passion for ice cream. A study has been done to determine the mood of the nation at any given time by a massive effort to analyze the aggregate content of Tweets. The article also has a "mood map" that shows changing moods by states. The author of 1000 blog posts over four years gives ten tips to other bloggers. ESPN Ombudsman Don Ohlmeyer takes a hard look at "The Decision" fiasco at the ESPN site. After a couple of Tweets with Su Ring, I found this web site with information about the Electric Cowboy Festival that was held here in our hometown of Columbia, Tennessee. It is interesting that with all the big name acts that it only drew about 10,000 for the three day festival. Now, Bonaroo draws 100,000 just 75 miles away. 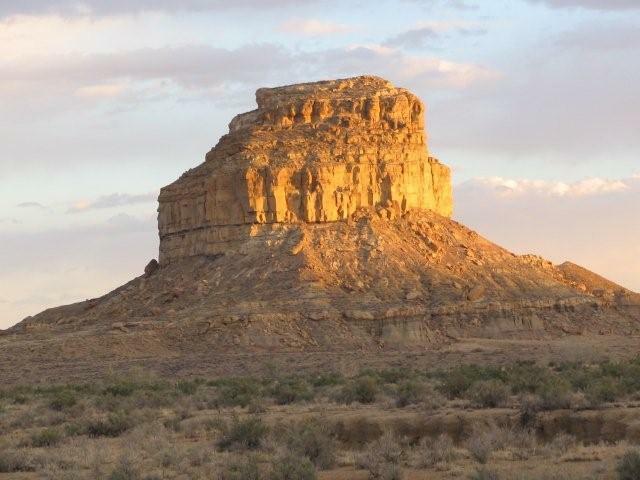 This week in our weekly travelogue feature, we highlight a fairly unknown place in New Mexico, called Chaco Culture National Historic Park. 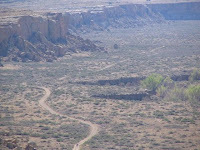 It is located northwest of Albuquerque about half way to Farmington. 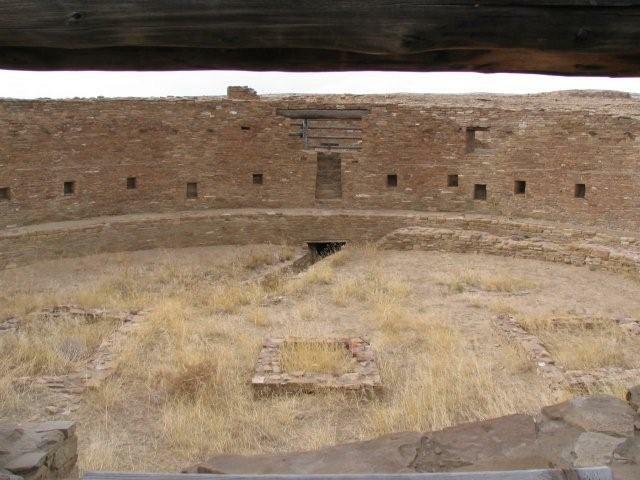 One of the unique features of the sites are that the Chacoan people had advanced knowledge of astronomy and built every structure based on the seasonal solstices and equinoxs. 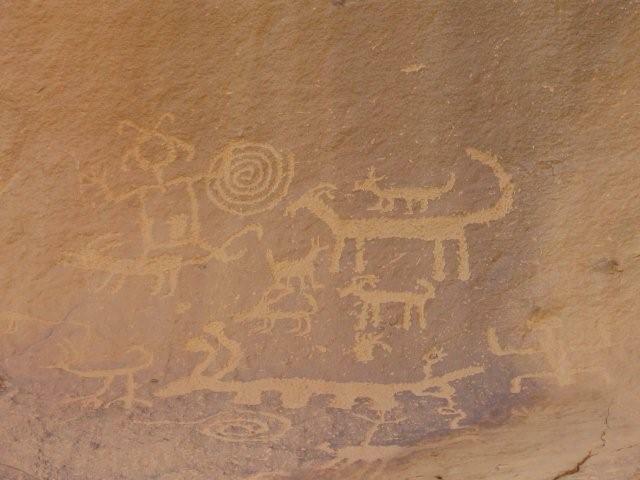 There are many petrographs depicting the sky as the people saw it. Today, one of the more interesting aspects of a visit to Chaco is participating in one of the night sky programs put on by the rangers and visiting astronomers. 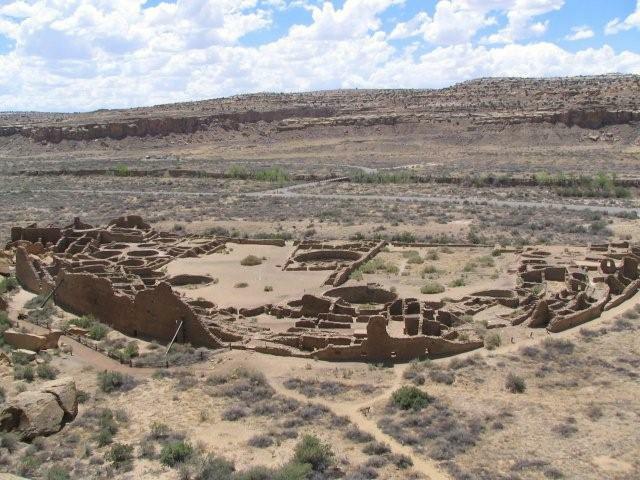 Chaco has one of the darkest skies anywhere in the United States. Looking upward at night, the Milky Way appears as a brilliant cloud that reaches from horizon to horizon. On one trip there, we were able to see the swirl of the Andromeda Galaxy with the naked eye which was truly amazing. You can visualize why the ancient people spent so much time focused on the heavens. 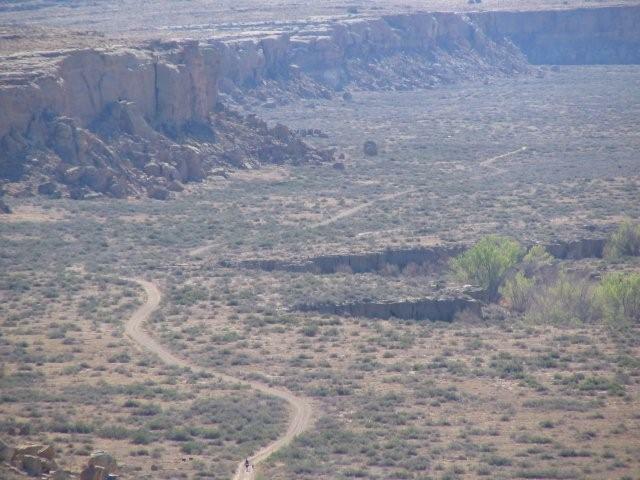 To be there at night, you almost have to camp in the primitive campground in the park. The weather is extreme with very hot, dry summers and brutally cold winters. I have hiked there in July when it was 110 degrees and visited in January when the roads were covered in snow and the temperature was near zero. 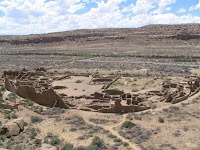 Visiting Chaco, and learning the history and culture of it's people, is a very deep spiritual experience and a great way to connect with the native American culture that lived there. 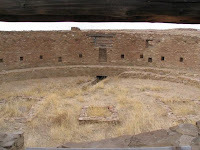 Chaco is still considered sacred ground to the indigenous people and they have ceremonies at the solstices and equinoxs to commemorate the seasonal passage. 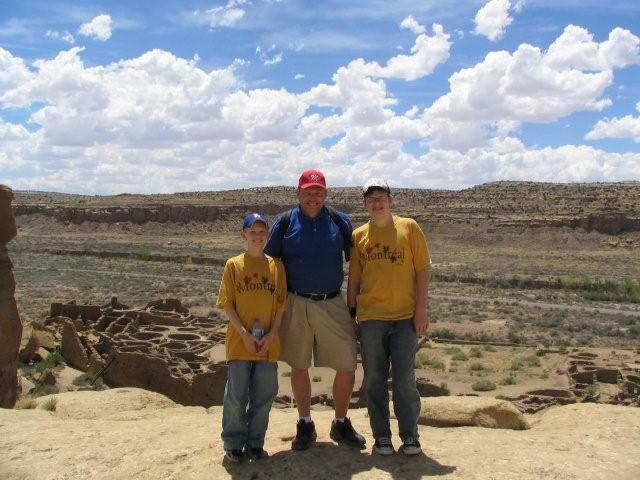 Even though it is out of the way and difficult to get to, a trip to Chaco Canyon is one that you will not regret or ever forget. From @cellblock303: We're happy to announce we took 2nd in Best Blog at #ToastofMusicCity. Congrats to @styleblueprint on winning 1st. Congrats guys! This is a major victory for a "non-traditional" hockey town. I doubt many hockey blogs are top three in any other city. Big Kev has a post giving them kudos too. AJ at PMFF has a great perspective piece on the Predator's "Re-boot." AJ is a very thoughtful member of the local blog community and always brings out stuff that others have missed. Jim Diamond has an article about Linus Klasen who was impressive at the Development Camp. Both Jim and fans are ready to see if he can transfer his production in Europe to the NHL. Mark is hustling to get away for the weekend but still left his "My View" with us. Dan Bradley jumps on Forechecker's site and has a few things to say about the Pred's positive recent moves. Shea Weber and Duncan Keith received the first President's Club Awards from the Kelowna Rockets at their Alumni Weekend that kicked off Wednesday night. The award honors former players that have gone on to receive extraordinary recognition in the hockey world. From@dchesnokov: Next summer should be interesting too. I have a feeling Alexander Radulov will be back in the NHL next year. For the first time, I am starting to think that Rads could possibly return to the Preds after next season. There would be fences to mend but hopefully he has matured since he left. The Predators released an MP3 of Tom Cigarran's interview on 104.5 on Wednesday afternoon. Dirk Hoag has the audio from Cigarran's appearance on the Thom Abraham Show yesterday. Cigarran confirmed talks with W. Brett Wilson and said that the team would only allow 30% non-local ownership. Chris Botta discusses the Devils basically telling the NHL to "Circumvent This." I guess if it wasn't for this huge NHL - NHLPA nightmare, we would all be complaining about a lack of hockey talk. This year's Kovalchuk saga is what Jim Ballsillie was to the off-season two of the last three years. Josh Brewster claims Bettman isn't a psychic at Inside Hockey. I bet if you asked Gary if he was, he would give a convoluted answer and you would have no idea what he was claiming. Russ Cohen has the rundown of the five inductees to the USA Hockey Hall of Fame. Art Berglund, Derian Hatcher, Kevin Hatcher, Dr. V. George Nagobads and Jeremy Roenick are included in the Class of 2010 that will be inducted on October 21 at HSBC Arena in Buffalo. Puck Daddy eulogizes the Twitter account of Paul Bissonette. Calling Kovie a "communist" must have been the last straw. Ryan at the RLD has the all worst contract team. It's hard to argue with any of them. I'm still astounded at the recent Derek Boogaard signing by the Rangers. His ability on the ice makes former Pred turned MMA guy, Patrick Cote look like an Olympic figure skater. Would the "Larry Bird Rule" work in the NHL? The Rick takes a look at the possibilities. Brian Metzer has an early look at the ice in the new Consol Energy Center at From the Point. Lyle Richardson has some interesting information about offer sheets at Hockey Independent. Devil's Ditch interviews James Murphy from NESN and Inside Hockey Radio. The Flames are really late opening their Development Camp next Monday. The Green Skeptic has a good piece about Adam Sherlip and his Hockey Foundation. Hockey fantasy expert and Dearly Beloved front man Rob Higgins is headed out on tour with Juliette Lewis and even bringing the tour to the South. I'm not sure how Nashville was not on the list since Juliette stayed here in Columbia over a month filming Daltry Calhoun with Johnny Knoxville. Alcohol and a severe case of Jonesing for NHL Hockey led to a fan's arrest in Winnipeg after he called police and demanded that the Jets return to Canada. PHT has the story. Intent to Blow has the official denial of the car accident from Rick DiPietro. The farm featured in the 1989 movie "Field of Dreams" is for sale for $5.4 million dollars. Boston.com has an interesting story of the family that has kept the field in pristine condition for the last 21 years and has never charged a penny to visitors to check it out. A new interesting marketing scheme comes from @dani3boyz: Heard buzz about Calvin Klein putting QR Codes in place of racy ads on billboards? Leads to racy vid Sure enough, if you use your QR reader you get a racy video on your phone. With yesterday's announcement that that there is an agreement in place to remove the "Boots" Del Biaggio black cloud from the Predator's horizon, the team my be in the best position on all fronts that it has seen since the franchise was conceived. Once the final paperwork is completed next month, giving the current owners 100% interest in the team, the Predator's ownership group will have much more leeway to plan their own destiny without having to wait for the other shoe to fall from an outside entity that they can't control. With a good base of strong local ownership that is committed to bringing the Cup to Nashville, they will be in a much better position to sell the game, grow the sport, and attract additional capital. A new naming rights deal with Bridgestone at the end of last season will be a springboard to additional corporate support as the economy improves. The hockey operations staff is one of the best in the NHL with GM David Poile and Coach Barry Trotz both in the top three for awards in their positions last season. The two together have exceeded expectations consistently and have defied the hockey pundits by making the playoffs five of the last six seasons. By drafting and acquiring players that fit the mold of "The Predator's Way," they have created a special brand of teamwork where all 20 players have to be "all in" giving 100% every time they hit the ice. There is no "star" system. As a group, the team is far better than the sum of individual players. On the ice, the Predators will start training camp in September with an abundance of riches and probably lose a few good players through the waiver wire because they can't find enough slots on the roster to keep them around. With the ownership on more solid ground, the Preds will be in a better position to sign keep homegrown players like Shea Weber, Ryan Suter, and Patrick Hornqvist before they gain free agent status. The future is even brighter with Hockey's Future ranking the Predator's prospects as being number one in the entire league. Players like Colin Wilson and Cody Franson debuted last year and should have breakout years in the coming season. For others like Brentwood native, Blake Geoffrion, Jon Blum, and Ryan Ellis, it is just a matter of time before they will become impact players at the NHL level. Attendance has held firm, even in a poor economy with high local unemployment. The Predators are one deep run into the playoffs away from adding the 2500 fans per game that will make a ticket to a Preds game tough to come by. While some have labeled Nashville a "non-traditional" hockey market, as each year passes, and hurdles have been overcome, it's looking more and more like the Predator brand of hockey is becoming a mainstay on the NHL scene. Opening night is Saturday, October 9. This will be the year that much of the past "potential" will blossom and should provide Predator fans with the best season yet. While things were rosy in Nashville, a really nasty rumor ran rampant last night that showed both the strength and flaws of the Twitterverse world of instant information. A caller to ESPN radio in New York started a rumor said that Islander's goalie Rick DiPietro has been seriously injured in an auto accident. For about thirty minutes there were thousands of Tweets with no source to confirm or deny the alleged "information." Fortunately, Katie Strang of Newsday was able to confirm that there was not an accident or injury in short order cutting off the head of the rumor before it spread further. Thus, the flaw of Twitter was that bad information spread quickly, while the strength showed up just as well in disseminating the good information even quicker and ending the stir in Isles nation. The most surprised person in the whole matter was DiPietro himself, who reportedly heard the rumor from a friend. Mark at The View from 111 has his usual thoughtful analysis of the road to the Predator owner crisis being resolved. Forechecker takes a look at the battle for Predator roster positions and how the waiver rules may affect folks going back to the AHL. Congrats to Section 303 for being a top three finalist in the blog category of The Toast of Nashville. We should find out today if they won. For those who missed the Tom Cigarran hour on 104.5, here is a nice summary from MarkMM on HF Boards. The Tennessean actual had a story about the Preds for the first time in over a week albeit by Brad Schrade discussing the financial side of yesterday's news. The Milwaukee Admirals signed defenseman Scott Lehman to an AHL contact on Wednesday. Lehman was injured early last season which limited him to 11 games with the Chicago Wolves. Michelle Kenneth feels like the Devils were Blindsided by the NHL. She explains at Inside Hockey. Also at Inside Hockey Kevin Greenstein calls the NHL to task for invoking their power in the Kokalchuk case in a thoughtful, well written piece . Matt Reitz make good points on why the NHLPA should not dispute the NHL's rejection of the Kovi contract. As Matt explains, almost every player in the league will lose money on the deal due to the escrow situation. Here is the older post from MC79 that Matt references. Justin Bourne discusses where the line is to be drawn in long term contracts. It appears that the NHL felt it was crossed but may not have much ground in backing up their decision. Devils insider, Speak of the Devs, interviews himself at View from My Seats. He actually refuses to answer one question. After being fairly low key about her new position as the New York Islander's social media guru, Newsday put Dani Muccio front and center in a story about business use of Social Media. Dani is very modest, but is in reality, one of the top hands-on experts in the burgeoning field of Social Media Marketing. Ryan at the RLD has the Top Five remaining free agents. Bolts on Ice has a Twitter interview with Dan Ellis. Dan will be missed by Pred fans but already has captured the fancy of Bolts fans without having taken the ice. Ryan Lambert of Two Line Pass/Puck Daddy fame has taken on the Tampa Bay Lightning as his home team away from home in an unusual twist. Here is his new blog about the Bolts. Look for more accurate goalie equipment in this year's EA Sports NHL 11. A preview comes from Hockey or Die. Congrats to Sarah Conners who has been named the web editor of the Glouchester Times. Sarah appeared on POTG radio a few times last year and has been a long-time fixture in our Twitter feed. Dani Probert, wife of Bob Probert, sent a nice thank-you letter to all that was posted in the Windsor Star. Folks are always at their best at times like these. Do you want a BlackBerry app that reads your email to you as you drive down the road? Here is one. For twenty bucks you can also speak emails back to it. The owners of the Puffy Muffin are sending 48 employees on an Alaskan cruise after they met "aggressive" sales goals during the economic downturn. Your rarely hear of a company doing anything this creative to meet their goals. The North American Windsurfing Championships are in San Francisco this weekend. That would be fun to see. In a story first broken by J R Lind of the Nashville Post, and now confirmed by the Predators, an agreement is in place to purchase the shares previously owned by "Boots" Del Biaggio from the federal bankruptcy court. A hearing is set for August 6th for final approval of the sale. The bargain-basement price for the shares is $15.2 million and will open opportunities for the Predators to go further in seeking new capital from potential owners. Some interesting Tweets came from Canadian W. Brett Wilson earlier today where he said, "@WBrettWilson: I love Nashville - the town, the team, the people .... Never count me out - on any deal - I have patience - and love the great game of hockey - that said - only time will tell ..." Wilson is considered a leading candidate to buy into the ownership group. A very upbeat Tom Ciggaran appeared on 104.5 The Zone on Wednesday afternoon and reiterated the information in the release put out by the Predators shortly before 3 p.m. CDT. Here is the full text of the release. Nashville (July 21, 2010) – Nashville Predators Chairman Tom Cigarran announced today that the Predators ownership group has signed an agreement with the bankruptcy trustee to acquire the entity (Forecheck Investments, LLC) containing ownership shares in the Nashville Predators held by the William “Boots” Del Biaggio bankruptcy estate. The agreement has been approved by the creditor’s committee and has been submitted to the bankruptcy court for final approval. Upon securing approvals from the bankruptcy court, the NHL, the team’s lender, and the Sports Authority, the team expects to complete the purchase sometime in August. The shares are being purchased by Predators Holdings, LLC through funding from the local ownership group. The Predators’ ownership group is purchasing Del Biaggio’s $25 million ownership stake for $15.2 million. In addition, the organization has agreed to withdraw its damage claims against the estate. Upon completion of this transaction, Predators Holdings, LLC will consist of: Tom Cigarran (Chairman), Herb Fritch, Joel and Holly Dobberpuhl, David Freeman, Chris Cigarran, De Thompson V, John Thompson and Warren Woo. Predators Holdings LLC originally purchased the Predators in December, 2007. Is anyone really surprised that the Ilya Kovalchuk saga has yet to see a final conclusion? After dragging on 19 days into free agency an agreement was reached with the New Jersey Devils and announced on Monday. A formal press conference was held yesterday with the full dog and pony show with all the right folks in attendance. From the moment the news leaked as to the terms of the contract on Monday, there was not single person with any knowledge of the CBA or just regular folks with a little common sense that didn't think that the gist of the contract was to circumvent the CBA. Last night's news that the contract was "rejected" by the NHL was only peculiar in that it took over 24 hours for the league to come to the same conclusion. It is reported that he NHL had five days to reject the contract, even if it made it through the initial review with central registry and that the NHLPA then has five days to appeal the rejection to arbitration. While other recent contracts pushed the limits, this one clearly was the one that broke the proverbial camel's back. The key issues were the total length, the variance between years, and the probable reality that Kovalchuk will not play for 17 more years. I am pleased that the league is drawing a line in the dirt on paying 44 year olds "chump change" (by comparison) in order to spread the cap hit over 17 years. I am not happy that they waited until after Devils fans were whipped into a frenzy and the official presser was held. A major player in the whole Kovulchuk ordeal who may take a bum rap in the matter is Kovi's agent, Jay Grossman. I am convinced that he works hard for his clients and is above board in his actions. Even Lou Lamoriello was highly complementary of Jay at the presser. My dealings with him have been refreshingly positive and he has been honest and forthcoming in our discussions. I think the eventuality will be that behind closed doors in the next few days, money will be shifted and the term reduced as a compromise not to further aggravate the growing hostility between the league and the NHLPA. The negotiations for the new contract at the end of the 2012 season are a darkening cloud on the horizon and contracts like this one will be a key point where the owners will want a rule in place to protect them from themselves. Three thoughtful posts about the rejection come from Puck Daddy, Adrian Dater and Craig Custance. TSN also has a factual post including the specific language upon which the rejection was based.If you are really worked up and want to read the entire 475 page CBA document, Cap Geek has a copy handy. The league also offered this official statement via NHL.com this morning with no time table for resolution. National Hockey League Deputy Commissioner Bill Daly today issued the following statement regarding the free agent contract forward Ilya Kovalchuk signed with the New Jersey Devils: "The contract has been rejected by the League as a circumvention of the Collective Bargaining Agreement. Under the CBA, the contract rejection triggers a number of possible next steps that may be elected by any or each of the NHLPA, the Player and/or the Club. In the interim, the player is not entitled to play under the contract, nor is he entitled to any of the rights and benefits that are provided for thereunder. The League will have no further comment on this matter pending further developments." Ryan Porth has the details of his new gig as the Predator's correspondent to The Fourth Period. It is really impressive watching the Pred's coverage grow. Our condolences to Ryan and his family in the passing of his grandfather in Iowa early yesterday. Everyone, please send your thoughts and prayers their way. The funeral is Saturday. Jim Diamond writes that Matthew Lombardi will be a good fit for the Predators and I agree. Forechecker has the Pred's press release regarding their donation of $125,000 to the Monroe Carrell Children s Hospital at Vanderbilt. He was also up early today with his breakfast links that includes a little cheese cake with the new Pred's dancers. He also did a good job talking hockey on 104.5 last night. PredsBlog had another Puck Pile yesterday that includes things you may have missed in the hockey world. Dave Gutzman has Ten Remaining Questions about the Predators. Jeremy at Section 303 has a list of games that fans don't want to miss in the upcoming season. There should be a new edition of the 303:30 up soon with Kevin Weekes in the near future. I can't wait to hear more from Kevin. Prior to all hell breaking loose last might, Michelle Kenneth was the leader of the pack in calling the Kovalchuk to the Devils deal. Here are her thoughts on The Day After as well as an interview at MTR Media. The Day After piece is fairly heavy stuff as Michelle is very open with her thoughts. Chris Wassel wrote about the presser and the last sentence in his post was an ominous thought that was at the root of last night's developments. Sports Business Journal has an extended look at sports team's use of social media with ten different folks in the business. The variety of angles here is interesting. RLD Hockey analyzes several front loaded contracts that make a mockery of common sense but are allowed under the current CBA. Mike Modano wants to skate a bit in August before making a final decision on playing in the coming season. Russ Cohen has nice things to say about Simon Gagne as he leaves the Flyers. The Thrashers have banned vuvuzelas. It should be a league wide rule. In an effort to keep hockey in the news comes this bit of information from @EJHradek_ESPN: The NHL is planning a Winter Classic kick-off press conference at Heinz Field next Tuesday (7/27). Prominent players are expected to attend. Intent to Blow uncovers the basis for the 17 year gazillion dollar contract with Kovalchuk. Lou Lamoriello is trying to force a lockout so he can take an extended vacation. Knucklepuck at Fanhouse has a vision of what the NHL will look like in 2026. An Amish teenager was charged with multiple offenses, including alcohol possession and "over driving an animal," after his attempt to flee the police with his horse and buggy early Tuesday morning. You never know what could happen next. Thanks to Michelle Kenneth for the heads up on this atrocity. Last night's podcast with Kevin Weekes, Michelle Kenneth and Launy Schwartz was without doubt, the most fun show that we have done in the last year and a half of POTG Radio. Kevin Weekes is the most genuine and sincere individual that you will ever meet and is an encouragement to anyone who has the pleasure of hearing him. At one point in the show, he gave advice to my son Jackson that would be beneficial for anyone to hear. It was truly a mantra for positive living. On the "Weekes for Backup" front, Kevin said that he not filed his retirement papers with the NHLPA and is always willing to listen to any opportunities that present themselves. I hope David Poile is listening. Having Kevin in the dressing room would be worth several wins just from his inspiration. We thank Renee Weekes and Michelle Kenneth for their help in setting up Kevin's appearance. Michelle and Kevin have known each other for a while and she was able to get Kevin to open up on a few nicknames that he has had for folks over the years as well as his flair for fashion. It should also be noted that Michelle never wavered on her prediction that Ilya Kovalchuck would remain a Devil. We also had good friend, Launy "The" Schwartz from Hockey54, who was named on Monday as one of the 10 finalist of The Score's Drafted 2 contest to find the next great Canadian sportscaster. We are the Southern headquarters for his campaign. Since Launy and Kevin are both goalies from Toronto, they hit it off instantly. More so than usual, I would encourage each of you to listen to the podcast at BlogTalkRadio or download from iTunes as it will make you feel better about yourself just from hearing such an upbeat discussion. The Predator's group of writers continues to grow on the Internet as is shrinks in the mainstream media. From Ryan at RT @RLDhockey: I am proud to announce that I'll be joining TheFourthPeriod.com this fall as their Nashville correspondent!! Congrats on the new gig in addition to the great work at the Red Light District. Forechecker and Dave Gutzman both had posts on the ramifications of long term high dollar contracts. Section 303 also ckecks in on the Kovi signing. Alan Bass has a look at Colin Wilson and his early career contributions. Rachel at What The Puck has good intentions and will return with the second annual summer hockey movies series. PredsBlog is up to goal number 3 on the Hornqvist tally. Pred's coach Brent Peterson is the guest of honor at a benefit for Parkinson's golf tournament in Lindsay, Ontario this weekend. The hockey news of the day on Monday was the Kokalchuk saga finally coming to an end with his re-signing with the New Jersey Devils. Best I can tell from my Twitter feed, the Devils actually broke the story themselves via Twitter followed shortly by this release from Jay Grossman's Puck Agency. Congrats to Jay and his client on their deal. Helene Elliott has the Kings side of the signing. Cap Geek has the contract details. A formal presser is scheduled this morning for 12 Central. Down Goes Brown has what they believe is a copy of the contract. Michelle Kenneth has her take on the Kovalchuk signing and the full story at Inside Hockey. Michelle never wavered from her belief that Kovi would remain a Devil. She got big props from Eklund for being right all along the way. Matt Reitz got his notice that his payment was due on his LA Kings season tickets. Bad timing. The other big move of the day was Steve Yzerman obtaining Simon Gagne from Philadelphia in exchange for Matt Walker and a fourth round pick. It was a good move for both teams as it strengthens the Lightning and brings the Flyers under the salary cap. Red Light District takes a look at the open captain positions around the league and who may ascend to the positions. Adrian Dater discusses a possibly NHL work stoppage at All Things Avs. A funny description of our friend @adater from @helenenothelen: @adater perfect description of yourself. tho i wouldn't have called u a glass half-empty guy. woulda said you're an 'is there a glass' guy. Here is an interesting interview on blogging and writing with Dan Steinberg of the Washington Post. Too Many Men on the Site has the five worst free agent deals on the books. Number one was easy. Where would the Kovalchuk deal rank now? A look back at the Texas Star's season by @txstarsgirl D'Ann Faught at the new Hockey Quarterly. This is a new site with several good writers already on board including Nashville's own, Mark Willoughby. Here's something to look forward to next month. Russ Cohen of 100 Ranger Greats will team up with Ranger Crisis for a live broadcast of Ranger History from Bar Nine on August 21. Will it be shuffleboard or hockey for Mike Modano? Intent to Blow is following the biggest campaign to land a contract since Kovi. You can't make this up. A man was arrested in Mexico after a plane flight from Peru after getting caught smuggling 18 monkeys into the country in a girdle around his waist. How do you fly on a plane with 18 monkeys and not look suspicious? There is also a video at the link. I'm not sure why they are still bound in the video. Our good friend Launy "The" Schwartz of Hockey 54 was named a finalist of The Score's Drafted 2 contest that is seeking to find Canada's next sportscaster. There was no doubt in our biased minds that Launy would make the top ten and now go on to claim the title. 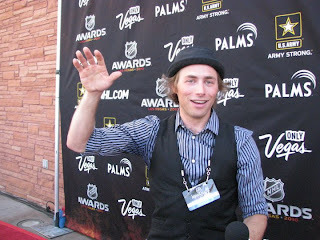 If you aren't familiar with Launy's work and unique style of interviewing, go here to see some of his recent work at the NHL Awards show in Las Vegas. Credit should also go to Dahlia Kurtz, his producer/camerawoman who is his biggest advocate (other than us, of course). Here is a video from The Score with Launy answering a few questions from last year's Drafted winner. His submission video is also included at the link. While you are there make sure and vote for Launy in the lower right hand column. Congrats to Launy for making the top ten. You have our full support as you go forward. I can't wait until one day we can say that we knew you before you were famous.